Sunday night, CBS aired the 38th Annual Daytime Emmy Awards, a celebration of daytime television hosted by Wayne Brady of Let's Make A Deal. The Las Vegas awards show featured performances by Cirque Du Soleil, Celine Dion, Marie Osmond, and Penn & Teller. Lifetime achievement awards were presented to game show hosts Pat Sajak and Alex Trebek (for Wheel of Fortune and Jeopardy!, respectively), and the first Crystal Pillar Award was given to Oprah Winfrey. However, for culinary fans, the real celebrations took place earlier in the week. The Daytime Entertainment Creative Arts Emmy Awards were held the evening of June 17. The gala was held at L.A.'s Westin Bonaventure and was hosted by Steve Wilkos. Winner of Outstanding Culinary Program is Avec Eric on PBS, hosted by celebrity chef Eric Ripert. He also serves as one of the show's executive producers. 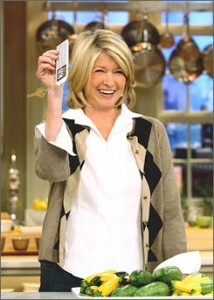 Winner of Outstanding Lifestyle Program is The Martha Stewart Show on Hallmark, hosted by domestic diva Martha Stewart. She is also the co-executive producer of the series. Stewart also won this year's title of Outstanding Lifestyle/Culinary Host for The Martha Stewart Show. Winner of Outstanding Directing in a Lifestyle/Culinary Program went to Anne Fox for Giada At Home on Food Network.